Allentown Music Club scholarship recipient Brennen Van Helmondt is a freshman at Saucon Valley High School. 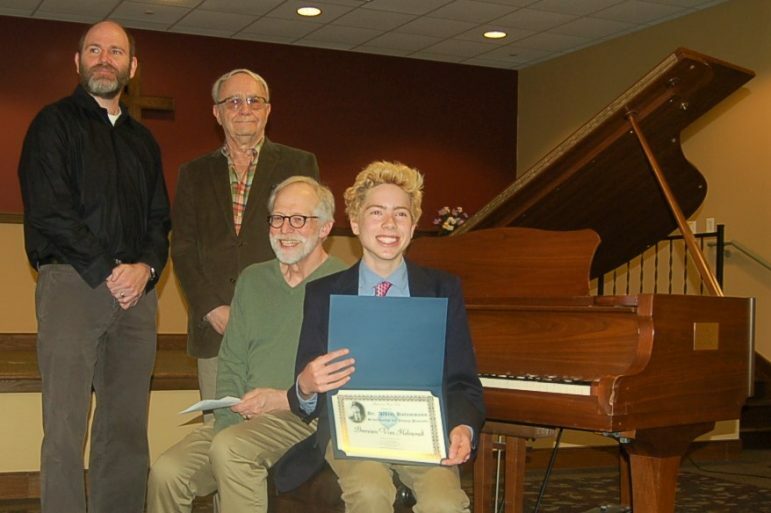 Brennen Van Helmondt, a freshman at Saucon Valley High School, recently auditioned for and won the Dr. Albert Hofammann Scholarship awarded by the Allentown Music Club. The pieces Van Helmondt performed at his audition were Schumann’s Fantasiestücke, Opus 12, No. 2 – Aufschwung and Beethoven’s Sonata in C Minor, Opus 10, No.1, 2nd Movement. The $1,000 scholarship he was awarded will be used to continue his study of piano performance. He studies piano with Jonathan Beitler and is a former student of Lori Huth. Van Helmondt is a member of the Saucon Valley High School Swim Team and advanced to districts in the 100 meter breast stroke. He is also a member of the tennis and Scholastic Scrimmage teams at Saucon Valley. He enjoys cooking, fostering cats and hiking with his family and dogs.